On this page I'll be listing my items for sale. I can be contacted at MarkMiller@embarqmail.com regarding items for sale. Additional pictures on request. Please send me your address and I will quote shipping. All items listed here have a lifetime guarantee of authenticity & include a signed Evaluation Sheet. If you have any for sale feel free to contact me as well. For opinions on your own collection please read the CONTACT page, pg 31, first before contacting me. Item #1 This one is a French Biscayne trade axe reportedly found by a man metal detecting in upstate NY. and found a cache of 9 of these. Likely made in Bayonne, France & from the ca. 1680-1690s period if the find location is accurate. It is complete & undamaged other than the typical excessive pitting. There probably was a cross in circle mark at one time although any marks are no longer legible. It measures 7.88" X 3.67" & weighs 2 lb. 8.8 oz. It was not excessively cleaned & I only oiled it with Boeshield T-4 oil. It always amazes me when these 350 year old axes found in the ground are still good enough to sharpen & use again. But don't do it! ITEM #2 Ca. 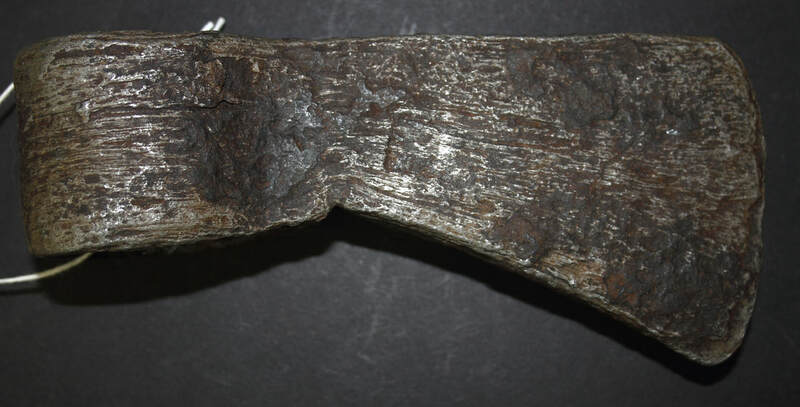 1770-1790s Pipe Tomahawk head reportedly found in Lake St. Clair, MI. not far from shore by a man who often searched the shallows looking for artifacts. Lake St. Clair averages only 11’ deep. This was a major trade corridor between Fort Detroit & Lake Huron for the Ojibwa, Mississauga & Pottawatomie tribes, among others during this period. Bowl was hammered during period. Large eye, probably French with steeled edge. It is a fairly large size as Eastern pipe tomahawks go at 7.95” X 2.95”; wt. 1 lb. 2.3 oz. Circa Revolutionary War to Northwest Indian War. 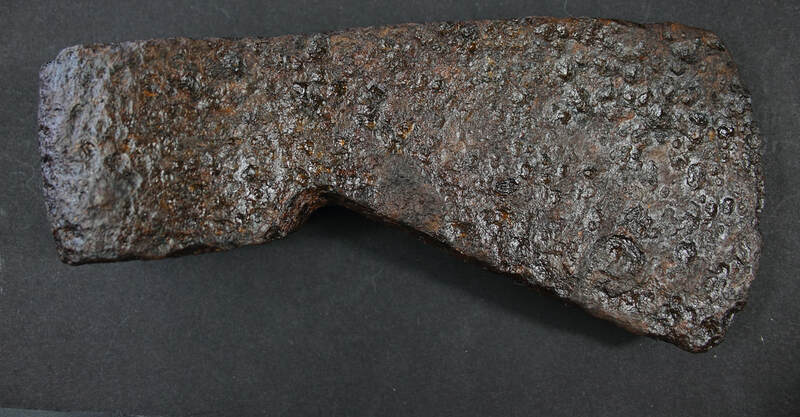 This is a medium sized trade axe head metal detected along the Marionette River, WI. It was blacksmith marked but no longer legible. 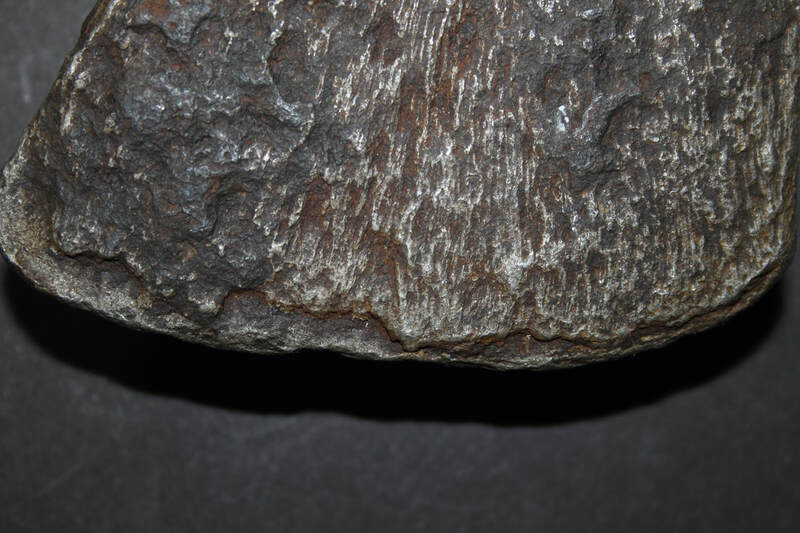 The striated appearance is the wrought iron 'grain' brought out by extensive corrosion. The steeled edge is exposed at the edge. It measures 6.84" X 3.09" and weighs 1 lb. 15.9 oz. This is a medium sized trade axe head metal detected near Eagle River, WI. Its blacksmith marked but no longer legible. The blade is cracked on one side. It measures 6.52" X 3.02" and weighs 1 lb. 10 oz. 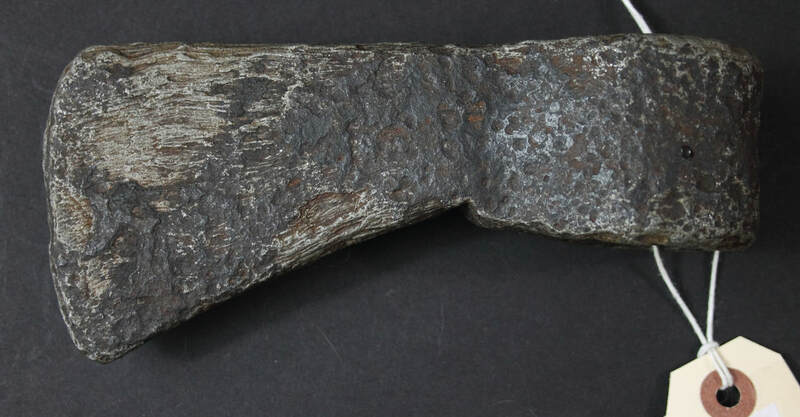 Small unmarked trade axe head (belt size) 5.27" X 2.17". It weighs 10.4 oz. 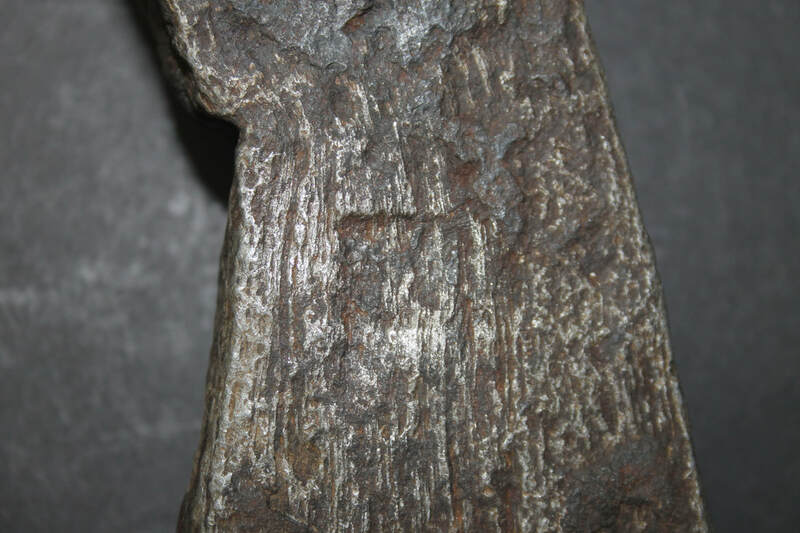 It originally came to me with an old tag saying found 1 1/2 mile Southwest of Bear Butte, SD." however when I ended up buying it later the note was lost. Bear Butte has been a sacred site for many Indian tribes for 4,000 years. Sioux or Cheyenne perhaps. The edge had been sharpened slightly after it was found. Item #7 16th C to 17th C. bronze/brass fur trade Jesuit ring marked “IHS” traded to Indians. There are also several tiny crosses in circles or X's in a circle on each side. Found in Socorro County, NM. A Spanish Mission there traded to Native Americans. The raised letters IHS used to be thought to mean 'In His Service' but are probably Latin for Iesus Hominum Salvator (Jesus Savior of Men). (There is a Jesuit Biscayne trade axe shown on page 9 of my website with this mark also with a more complete explanation for the mark.) Beginning in the 1500’s Spanish colonists journeyed up the Rio Grande Valley and established settlements and mission churches along the way. This style of IHS ring was typical of the Spanish missions. There were several mission churches including the SAN MIGUEL MISSION in Socorro, the oldest Catholic Church in the United States. There is still dirt on it from having been found but I didn't want to clean it further. Unlike modern rings they were meant to be worn only to the first or second knuckle. These are generally referred to as finger rings which go back to Roman times if not earlier. The IHS rings seem to be the more rare of the fur trade finger rings. Mid 19th C. Plains elk antler hide scraper with red ochre on it. As steel scrap became available they later lashed homemade blades to these cut from other trade items. 12" x 4 3/8". A word about the modern hafts I've made. Years ago I made a few trade axe hafts that apparently fooled the Antiques Roadshow 'expert' in Pittsburgh even though the owner insisted they were made 2 weeks previously--the expert didn't believe it. For years after hearing that I stopped making haft replacements thinking I did not want to contribute to further misidentifications. Later on I began making them again, not always as well as I could, & marking my initials on the end of the hafts. I understand many want to display them on the wall & most do not have the original hafts. Always check for my initials of "MM" on any hafts I have made on the bottom end of them or else the obliteration of them.